PISCATAWAY, N.J. (AP) — As the red and white confetti rained down on the court to celebrate C. Vivian Stringer’s 1,000th career victory, the Hall of Fame coach took a moment to soak it all in. She was surrounded by family, friends, former players and coaches from all three schools where she coached. Stringer became the fifth Division I women’s basketball coach to achieve the milestone and sixth woman overall when the Scarlet Knights beat Central Connecticut State 73-44 on Tuesday night. As the final seconds ran down, the 4,583 fans held up signs and chanted the coach’s name. Her current team dumped a Gatorade bucket full of the confetti over their coach’s head. Video tributes from all the other living Division I members of the 1,000-win club were played as Stringer sat under balloons that spelled out CVS1K. Stringer also received many online tributes on social media, including one from Hillary Clinton . Rutgers presented her with a banner to celebrate her 1,000th win that will hang in the arena’s rafters. She also received a customized pair of shoes that listed the number of wins she had each of her three schools — Cheyney State, Iowa and Rutgers. Many of her former players were on hand to witness the milestone victory. She’s 1,000-402 in her career. New Jersey Gov. Phil Murphy was also sitting courtside for the historic win. South Carolina coach Dawn Staley also made the trip to New Jersey with her staff that included Jolette Law, who was an assistant for Stringer at Rutgers for many years and played for her at Iowa. Staley’s Gamecocks play on Thursday against Clemson. She said she had no doubt in her mind she should be at Rutgers for this game with all that Stringer has meant to African-American coaches. 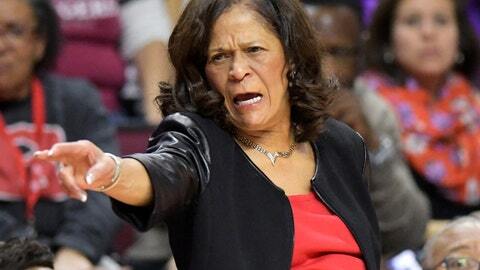 While Stringer remembers many of the victories over her 48-year coaching career, one that she doesn’t recall is her first one at Cheyney State. In fact, no one can specifically remember who her team beat to get that first victory. Stringer laughs about it now, saying that she had no idea she’d be still coaching nearly five decades later and win 1,000 games. Stringer was concerned before the game that her team would be under a lot of pressure to win with so many people coming to celebrate the momentous victory. Her team made sure they wouldn’t go home disappointed. Caitlin Jenkins had 14 points and 12 rebounds to lead the Scarlet Knights.